In keeping with its strategy of reconverting high-profile heritage buildings (Les Grands Moulins de Pantin, CityLights, etc. ), BNP Paribas Real Estate has launched an iconic 37,000 m² scheme in Boulogne-Billancourt featuring innovative offices and services, scheduled for completion in 2022. 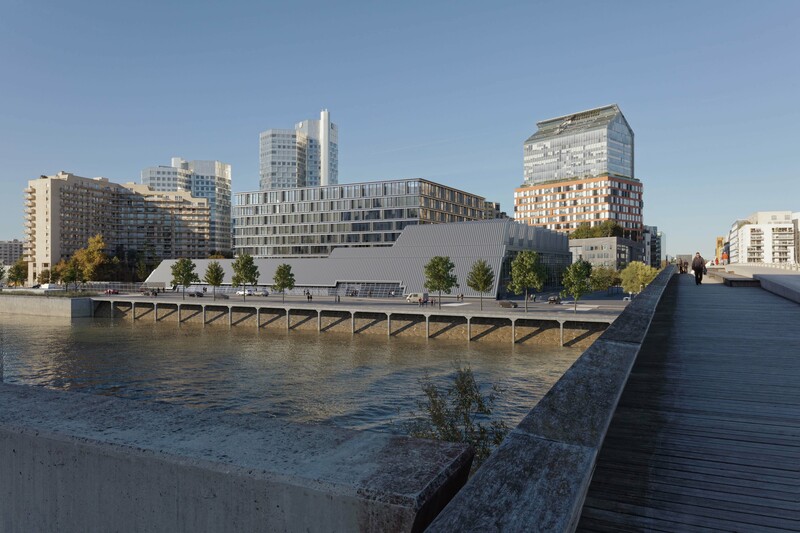 As a showcase for all the business lines and knowhow of BNP Paribas Real Estate, Métal 57 is located on the symbolic former Renault site in Boulogne-Billancourt (Greater Paris), at the crossing of major thoroughfares into Paris, along the Seine and right next to Ile Seguin. Keen to preserve the urban quality and 20th Century industrial heritage, BNP Paribas Real Estate is to convert the original building by Claude Vasconi and add another building to create an ambitious new complex, designed by Dominique Perrault. “Updating the original architecture without destroying it, as well as keeping the industrial characteristics while adding a new building are challenges in both town planning and architectural terms. Underpinned by its drawing board work with architect Dominique Perrault, BNP Paribas Real Estate aims to rise to this challenge to make Métal 57 a building that symbolises a new generation of offices”, explains Thomas Charvet, General Manager of BNP Paribas Real Estate’s Commercial Real Estate Development. BNP Paribas Real Estate’s scenario for Métal 57 is to build offices that cater to the new world of work, emphasising the sheds of Claude Vasconi and designing new inclusive and disruptive work spaces. “Size is the issue for BNP Paribas Real Estate. Our ambition is to reconvert this historical, architectural and industrial building into a contemporary office building, open to the world. This scheme is a fully-fledged laboratory of ideas and experimentation, through which our teams anticipate the experiences and real estate uses of the future” notes Thierry Laroue-Pont, Chairman & Chief Executive Officer of BNP Paribas Real Estate. Innovation remains core to our thinking and Métal 57 will strive for excellence in terms of wellbeing in the workplace, its integration into the city and its mixed uses. Apart from its high-quality architecture, this building offers a multi-faceted life through the many services that occupiers can access directly, but also with a possibility of opening to the public, including locals, making Métal 57 a convivial place for meetings, exchanges and diversity. Métal 57 will notably offer a diversified “food hall” style catering hub (including cafés, bakery, trattoria, etc. ), a gym, auditorium and conference facility. Métal 57 will also reshape the urban landscape with plans to introduce new public spaces, thereby creating a continuity of free space and offering direct access to transport and notably the future “Ile Seguin – Pont de Sèvres” station of the Grand Paris Express (line15). Furthermore, the scheme features a strong commitment to social responsibility and ambitious environmental initiatives; it is notably aiming to be certified HQE Passeport Exceptionnel and BREEAM Excellent. “By building the future without renouncing the past, opening onto the city, we want to make this building a testimony to all the knowhow of our business lines, our innovative spirit and above all the crucial importance we attach to mankind. Metal 57 will be the new HQ of BNP Paribas Real Estate from 2022”, adds Thierry Laroue-Pont. Completed in 1984, during the era of Large State Projects, 57 Métal was designed by the archi­tect Claude Vasconi to accommodate Renault factory workshop, making it a forerunner of the large-scale industrial urban development “Billancourt 2000” for which it was a precursor. As a rare honour and proof of its importance, the new building was listed. This paragon of modernity thereby joined a set of great monuments, yet it was neither a museum nor library, but a workplace. Some years later, the company decided to close the Renault Billancourt production site… This brought about its first change of use. The 57 Métal building and its huge hall were transformed to host major marketing events for the carmaker. Overseen by the architects Dominique Jakob and Brendan MacFarlane, this refit was completed in 2004… The 57 Métal building thereby became Square Com. The building was then definitively vacated and sold… Many people rightly took action to preserve it. “Together, we have succeeded, confirming our expertise in this type of building rejuvenation, such that they stand as a testimony to their époque: Grands Moulins de Pantin, the Boulevard MacDonald warehouses, the building on the Rue Bergère, the former paper factories of Nanterre… It is undeniably a 21st century subject” concludes Thierry Laroue-Pont.